Zimbabwe's State-Owned Bus Service Back - But Is It Sustainable? Commuters queue to board a bus after work at the Charge Office bus terminus in Harare on Monday January 21, 2019. Commuter omnibus operators were yesterday forced to reduce their fares following the introduction of conventional buses mobilised by the Government to ferry passengers in and around Harare. Commuters in Harare and Bulawayo slammed kombi operators for exploiting them, with some people calling for their immediate ban. The buses are being coordinated by the Zimbabwe United Passenger Company (ZUPCO). 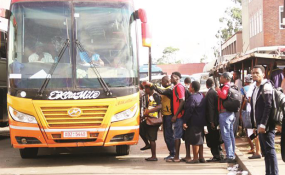 They started ferrying passengers as early as 5am yesterday, bringing relief to commuters who were being charged extortionate fares for a rough ride in commuter omnibuses. Kombis were yesterday trying to reduce their fares to match those charged by the conventional ZUPCO buses. Commuters from Chitungwiza and Norton are paying $1.50 and $2 for a bus trip, respectively. It is a dollar for the rest of the shorter routes. Kombis were charging $2 for shorter distances. For a trip to Chitungwiza and Norton, they demanded as much as $8. The conventional buses are using their traditional terminuses, displacing the unreliable kombis. The kombis are now using illegal pick-up points in the city. Zupco acting chief operating officer Mr Everisto Madangwa said the buses had been well-received by the commuting public. "We went in as a relief to residents who were being overcharged. They have shown appreciation and they are shunning kombis in favour of our buses which are secured," he said. Former Zupco chief executive Mr Bright Matonga said the introduction of the buses was a brilliant idea which was long overdue. "The introduction of a mass transport system was long overdue. It is a welcome development not only to passengers but it will help in reducing the fuel bill. Harare alone requires 500 buses, Bulawayo 150 to 200, Gweru, Mutare, Masvingo and other smaller towns require 60 buses each," he said. "For Bulawayo and other cities, the buses should service peak hours, that is from 5am to 9.30am and thereafter be deployed to peri-urban areas. For a bus to be viable, it must cash in $1 200 plus a day." He said the figure covers salaries and key service filters, oils and tyres. Mr Matonga said Government needs to subsidise fuel requirements. He said Zupco requires at least 1 500 buses. "It will also need cross border buses so as to raise foreign currency for spares and tyres," added Mr Matonga. Greater Harare Association of Commuter Operators secretary general Mr Ngoni Katsvairo said competition was healthy as passengers emerge the winners. "Competition is healthy and the passenger will be the biggest winner as fares go down. We are pleading with Government to expedite availability of fuel and the rebate system for passenger vehicles as this is the only way that will keep fares at affordable levels while keeping our business open and afloat," he said. "Kombis employ a big number of people and will always need Government support to keep those jobs afloat." Passengers yesterday hailed the introduction of conventional buses by Government. Mr James Kapeta said the move by Government shows its commitment to deal with the problems being faced by the country. "People should learn to be patient for improvements to be felt. Things cannot be fixed overnight but I can tell you if we are patient we will get what we yearn for. Such initiatives like the ZUPCO buses show that Government is alive to the challenges being faced by the population," he said. "Government wants people to be happy but people are just panicking. We are happy that the buses are affordable and will help us to get to work," he said. Mr Moses Chigova thanked Government for the buses saying they would cushion workers from high fares. "We thank Government for the initiative. It has enabled us to come to work. Kombis were charging extortionate fares," he said. Mr Abel Mutanda said, "It is a good programme by Government. I hope they will also move to other sectors because the cost of living is very high. We cannot afford basic things." Ms Charity Sanyanga implored Government to increase the number of buses. "Government has done well by introducing these buses. They should increase the number of the buses because they are helping communities. Imagine I paid $2,50 in the morning, that is $5 because I was taking my child to the clinic. I am relieved that now I will pay $2 because the buses are charging $1," she said.